KHO Bali: The Kerobokan Home Office is buzzing with activity preparing for the Gala Celebrations for John's 60th birthday. Already many people have booked to fly-in for the celebration. Most flights are already fully booked out. Pak Made from Warung Sobat has announced that seats for the Birthday Eve Dinner limited. Party Organizer Jamal says, "You must book through the KHO, no bribes or corruption will be accepted." taking daily blowing lessons at the Bali Body Irrigation Works. the afternoon Street Parade to be presented by the Balinese villages. Famed Jakarta Singer/Guitarist Oney will fly-in and perform at the Gala 60th Birthday Eve Party. 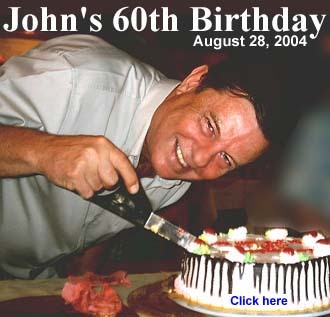 has been John's friend for over 42 years, has agreed to come to Bali and attend John's 60th birthday party and present the speech John is currently writing about himself. Jamal is currently trying to find a violinist to accompany Mr Davey. Melody owner of Purnama restaurant claims the demolishing her establishment is nothing to do with John's 60th birthday. Monsieur Albert of Paris, was guest of honour at a welcome dinner at the KHO Sat Jul 10. Nancy arrived home safety from Bali. She wishes to thank everyone for making her stay so enjoyable. about the house and cooks breakfast every morning. He will return home Sept. 2. The KHO main bathroom features an automated lighting and sound system. On closing the door the lights, fans and sound system are activated. It features a computer generated voice welcoming you to the bathroom. Also music is fed to the ceiling speaker. The problem has been that the voice has been mixed with the music, making it difficult to hear. We have now built a timed relay switch which switches between the voice announcement & music. transistor in the on position. Slowly the capacitor discharges through the fixed and variable resistor (E). When the charge is depleted (around 20 secs) the transistor turns off, in turn turning off the relay (C) switching the speaker from the voice to the music. In order save space and not have unsightly speakers on the lounge room wall, we mounted the outside on the above-window air vents. We have now installed 2 florescent lights in the pelmet on the west & north walls of the dining room. Originally there was 1 florescent light in each, which was not bright enough. The reflective lights are for very dull days during rainy season, which doesn't arrive for another 4 months, but we are ready. The KHO jeep now has a fully renovated drivers door. It had rusted through and was in a terrible state. While John was in Australia Pak Made and Jamal took it to the panel beater for repair. In her quest to build the Bali Zoo, Ines has now acquired a breeding pair of rabbits. She has already constructed a hutch with a snake proof fence at huge expense. This adds to her collection of 6 dogs and her 3 feline pets, Hamzar, Dede and Andi. banned dogs from the restaurant. We interviewed owner Pak Made, who said he regrets having to enforce the ban and it will make a minority of customers unhappy, however the majority of customers are pleased with the regulation. Note Ines: No rabbits either, that is unless you want to eat them. The selection of wines has much improved in our area over the last couple of years. Many new outlets have opened. Most prices are more than you will pay at home, but there are often specials, so it is worth looking around. BEST WINE SHOP - Long established in the main road, they moved last year around the corner, just before the jail. Indowines Wine House - has a good selection of imported wines, just over the road from Warisan. The Bali Deli - Turn into "The Villas" street, near the far end, or enter from the Sunshine Road. Good selection of Quality wines. The Living Room Restaurant - has the Baccus bottle shop at the back - a bit pricey. Bintang Supermarket - has a wine section offering local, imported wines and spirits. Look out for spirit specials. The New Arum - previously Alas Arum Supermarket which closed a year ago, has re-opened with a reasonably large wine and spirit shop. The are 3 wine makers in Bali, the largest being Hatten Wines who produce a Rosé, AGA red, AGA white, Alexandria white and Jepun, a sparkling Rosé. The other two are Wine of the Gods and Indigo. There are various ways of getting to Lombok by sea and air. Harbour, daily at 0900 for Gili Meno. It departs for Bali at 1400. Cruises at 45km/h & takes about 3hrs. Cost US$40/A$56 One Way. The next is to fly the regular Merpati airline service, departing hourly (in high season) from Denpasar to Mataram airport, Lombok . Cost US$30/A$42 OW. The CASA 235 aircraft is built in Indonesia under licence from CASA Spain. it cruises at 455km/h is non-presurised and seats 42 PAX. The Mosquito bears Malaria, Dengue Fever and many other diseases and is the worlds largest killer, with over 3,000 deaths per day. The Kuta area in Bali is said to be Malaria free. the person's liver, enter the livers cells. Once inside the red blood cells, the parasites grow and multiply. The red blood cells burst, freeing the parasites to attack other red blood cells. Toxins from the parasite also are released into the blood, making the person feel sick. World wide mosquitos have become 80% immune to most drugs. ventilated. If you have an enclosed, air conditioned room, spray room 4 hrs before retiring. Plant basil outside your windows and around doorways, this will keep mosquitos away. Remove breeding areas. Pour a tablespoon of kerosene in non-fish ponds around your house. Make a fish pond, fish eat the lave. Australian Peter Finlason has opened his luxury guest house villa in Seminyak. Peter is a part time actor and wine grower. large air-con color theme bedrooms with en-suite bathroom. Also there is an upstairs suite, with a polished wooden floor and a balcony with paddy field views. Umah Watu is an excellent alternative to staying in a hotel. Guest house suites are available from only US$60 p/n. by Sergeant Van Droorgt who went to lock the undercarriage. Bas was covered in bruises and burns and was suffering from shock. By this time, Bas had regained consciousness and told the Dutchmen that he was from Koepang. He refused to tell them anything else. Bas was in Darwin Hospital for 3 months. At that stage, Bas felt safe enough to disclose his name and that he had run away. assisted with his recovery and his early training. Mick Driver soon enrolled Bas into St Mary's Primary School and he quickly learnt how to ride a bike and play football and cricket. Bas also attended Mass regularly and became an altar boy. Bas received impeccable social training at Government House. He assisted with receptions and became a model young citizen. Thanks to the Administrator and his wife, Bas was now ready for the outside world. In 1951, he was formally adopted by a local carpenter, Norm Ballard and his wife Bertha. Bas commenced work at Izod Motors as a greaser, general hand and spare parts clerk, and he had other jobs such as a spray painter at the RAAF. Later, he moved on to the Commonwealth Dept. of Works and Housing where he stayed for 40 years before he retired in 1991. The competition in live variety programs between Channel 9 and HSV-7 was intense. Sir Frank Packer had recently bought GTV-9, which was rating well with it's complete radio and Tv "Television City" product, headed by Graham Kennedy and side kick Bert Newton. In Melbourne Tonight rated so highly it was very much envied by the Herald-Sun organization. Graham Kennedy and Bert Newton were at the height of their careers, not only appearing every night on IMT they did a 3 hr morning program on sister radio station 3AK. HSV-7 were desperate something had to be done to topple Channel 9's lead. and chip night. With work over for the week, dad would usually have a few beers with his working mates at the pub. In those days the Melbourne Pubs closed at 6 pm. One could order as many beers as you liked before that time, then you had 15 minutes to finish them. After closing time he would head off to the nearby Fish & Chip shop for some, Fish and Chips, all fried in lard (animal fat), smothered in salt and vinegar wrapped up in newspaper. He would arrive home just after 7, mum would put the Fish and Chips in the oven, then she and the kids would enjoy some Tarax lemonade dad had bought home. Dad of course would have a beer. Mum might even have a dash of beer in her lemonade (a Shandy). At 7.30 the Fish and Chips would be served in front of the Tv as the whole family sat down to enjoy Sunny Side Up. The biggest studio Channel 7 had was far smaller than Studio 1 at Channel 9, there was no dedicated audience area, it was just too small for live variety. Kennedy was not happy with the new regime at 9, so he resigned and moved to channel 7. He was put in charge of bringing 7's ratings up and toppling Kennedy. The Ed Sullivan Theatre NYC still going strong with the "Late Show" with David Letterman. closed and were sitting idle. Channel 7 was able to take over the disbanded Hoyts Theatre Fitzroy, a couple of kilometres from the Melbourne CBD. The whole construction job was done in a few months. A lighting grid was assembled across what was the upstairs seating area. A floor was fully cemented from the audience area to what was the old stage. Two huge cycloramas (Cyc's) were installed. The studio floor area was huge. The studio was connected to the Dorcas St. studios by 2 microwave links, one up and one down. The Audio was send and received by high quality telephone lines from the Postmaster Generals Dept, (PMG) The studio was equipped with 3 brand new black and white Marconi MkIV cameras. mixer was supplied by RCA USA and was capable of key effects. The Teletheater had many technical innovations and also many problems. The audio mixer was built in Australia under contract by AWA. The faders or individual volume controls were made using a stepping resistive system, rather than a geared potentiometer. The end result was the sound would fade up in steps rather than smoothly like a conventional potentiometer, also they were susceptible to dust, often making loud crackling sounds while we were on-air. The opening of the teletheater was the spectacular to end all spectaculars. Norman Spencer had imported from the USA, Bob Crosby, to host the show, Co- starring was British comedian Jimmy Edwards. The show featured many local stars of the time, a brass band and circus elephants. 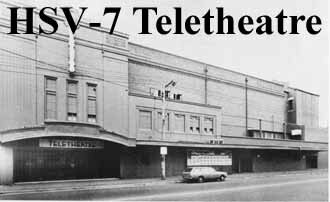 On opening night the Teletheater was far from completion. Most of the new equipment had not turned up and the broadcast was really an OB (Outside Broadcast), Equipment was pirated from all over the place. The OB van was parked out the front of the theatre to relay the pictures back to Dorcas St. The lighting console was the only new equipment working. The audio mixer had not turned up from AWA. So various portable 4 channel mixers, sourced from Dorcas St and sister radio station 3DB, were strung together on some card tables and operated by Colin Stevenson, assisted by audio boss Ian McLeod. The previous day it was realized the station didn't posses enough microphones to cover the spectacular. Ralph Clarkson phoned old mate and Neuman microphone importer Wolf Grey who turned over his entire stock mics, saving the day. The tension in the teletheater before the show was incredible. Equipment was breaking down due to the heat of the lights from the un-airconditioned theatre. Against all adversity Norman Spencer got the show on air. He was so tense he threw up in the rubbish bin 5 mins before airtime. Star of the show was Bob Crosby, who was famous for his band "The Bob Cats" - he was the brother Bing Crosby. but Crosby continued to make films and personal appearances, sometimes as leader of reconstituted dixieland-style bands, sometimes more contemporary sounding. Crosby died in1993 at age 80.
off the ball by the Queen’s husband, he is reported to have yelled out: "Stay close to me, Sir, and you’ll get your face in the newspapers!" Later he starred in Lionel Bart’s hit musical, based on Oliver Twist. In his later days he lived between Perth Australia and England. Jimmy Edwards died in 1988. He had travelled the world and entertained millions. later, Burr lost his third wife, Adrina Morgan, to cancer. Before dying of cancer in 1993 Burr gave away most of his fortune to his foster children, friends & charities. While Raymond Burr was in Melbourne he appeared at the Teletheater. my job was a gofa or do anything the head audio person needed. At the Teletheater there was a very rickety scaffold leading from the upstairs dressing room to the back stage area, so performers could appear from behind the curtains and not walk through the audience before their appearance. my head down as there were gaps in the planks. Suddenly, thump, I hit my head and bounced back laying flat on my back, I looked up, I couldn't believe my eyes, I had run into Raymond Burr's not inconsiderable stomach. He helped me up and I ran on. set up in one of the wards to show the Queen visiting the child patients. Now 18, I was again working as an audio assistant runner. The security was heavy, even for those times. We were all issued with very important looking "P" passes. Just before the broadcast, I was in the OB van, the Queen had already arrived and was attending a reception in some other part of the hospital. Suddenly the audio operator realized a microphone was not working in the to-be-televised ward. I was sent up to fix it. I ran up the fire stairs and out into the passage to the ward. There 5 meters in front of me was the Queen and entourage. 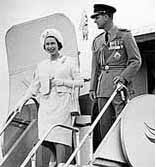 I screeched to a halt and stood hands behind my back with my back to the wall, terrified, as Her Majesty walked by.